Among the 1,190 islands in the Maldives, only 198 are inhabited. The population is scattered throughout the country, and the greatest concentration is on the capital island, Malé. Limitations on potable water and arable land, plus the added difficulty of congestion are some of the problems faced by households in Malé. This is a chart of trend of gross domestic product of Maldives at market prices estimated  by the International Monetary Fund with figures in millions of rufiyaa. For purchasing power parity comparisons, the US dollar is exchanged at 12.85 rufiyaa only. Mean wages were $4.15 per man-hour in 2009. The Maldives has experienced relatively low inflation throughout the recent years. Real GDP growth averaged about 10% in the 1980s. It expanded by an exceptional 16.2% in 1990, declined to 4% in 1993, and, over the 1995–2004 decade, real GDP growth averaged just over 7.5% per year. In 2005, as a result of the tsunami, the GDP contracted by about 5.5%; however, the economy rebounded in 2006 with a 13% increase. The Maldives has been running a merchandise trade deficit in the range of $200 to $260 million since 1997. The trade deficit declined to $233 million in 2000 from $262 million in 1999. In 2004 it was $444 million. International shipping to and from the Maldives is mainly operated by the private sector with only a small fraction of the tonnage carried on vessels operated by the national carrier, Maldives Shipping Management Ltd. In 1956, a bilateral agreement gave United Kingdom access to Gan in Addu Atoll in the far south, to establish an air facility in Gan in return for British aid. However, the agreement ended in 1976, shortly after the closing of the Gan air station. As of 2007, the Maldives has successfully promoted its natural assets for tourism. The beautiful, unpolluted beaches on small coral islands, blue waters and sunsets attract tourists worldwide, bringing in about $325 million a year. Tourism and other services in the tertiary sector contributed 33% to the GDP in 2000. Since the establishment of the first resort in 1972, over 84 islands have been developed as tourist resorts, with a total capacity of some 16,000 beds. The number of tourists (mainly from Europe) visiting the Maldives increased from 1,100 in 1972 to 280,000 in 1994. In 2000, tourist arrivals exceeded 466,000. The average occupancy rate is 68%, with the average number of tourists staying for 8 days and spending about $755. This sector employs about 20% of the labour force and contributes 3% of GDP. All fishing is done by line as the use of nets is illegal. Production in the fishing sector, was approximately 119,000 metric tons in 2000, most of which were skipjack tuna. About 50% of fish is exported, especially to Sri Lanka, Germany, UK, Thailand, Japan, and Singapore. Almost 42% of fish exports consist of dried or canned fish, and another 31% is frozen and the remaining 10% is exported as fresh fish. Total exports of fish reached about $40 million in 2000. The fishing fleet consists of some 1,140 small, flat-bottomed boats (dhonis). Since the dhonis have shifted from sailing boats to outboard motors, the annual tuna catch per fisherman has risen from 1.4 metric tons in 1983 to 15.2 in 2002. The industrial sector provides only about 7% of GDP. Traditional industry consists of boat building and handicrafts, while modern industry is limited to a few tuna canneries, five garment factories, a bottling plant, and a few enterprises in the capital producing PVC pipe, soap, furniture, and food products. There are no patent laws in the Maldives. The banking industry dominates the small financial sector of the Maldives. The country's seven banks are regulated by the Maldives Monetary Authority. The Maldives has no income, sales, property, or capital-gains taxes, and has been considered to have the simplest tax code in the world. The Tax Justice Network gave the Maldives a "secrecy score" of 92 on its 2011 Financial Secrecy Index - the highest score in that category of any actively-ranked country. However, the Maldives' minor market share put it near the bottom of the overall weighted lists. Beginning in the 1990s, the Port of Male received over 10 million in loans from the Asian Development Bank designated for infrastructure upgraded. The ADB notes that from 1991 to 2011, due to the loans, the ports annual throughput in freight tons equaled 273,000. By 2011 that number reached 1 million. The ADB also provided training for port authority staff to increase efficiency. ADB and the Government of Maldives, in a joint report address ship turn-around, "What used to take about 10 days in 1991 was achieved in 3.8 days by 1997, and about 2.6 days by 2014". Traditional economic activities such as mat weaving, jewelry making, thatch making and lacquer work are also found in Maldives. There is growing concern towards the coral reef and marine life due to coral mining (used for building and jewelry making), sand dredging, solid waste pollution and oil spills from boats. Mining of sand and coral has destroyed the natural coral reef that once protected several important islands, now making them highly susceptible to the erosive effects of the sea. The destruction of large coral beds due to heat is also a growing concern. In April 1987, high tides swept over the Maldives, inundating much of Malé and nearby islands which prompted Maldivian authorities to take global climatic changes seriously. An INQUA research in 2003 found that actual sea levels in the Maldives had dropped in the 1970s and forecasts little change in the next century. There is also concern over the questionable shark fishing practices in place in the island. Shark fishing is forbidden by law, but these laws are not enforced. The population of sharks has sharply decreased in recent years. The Asian brown cloud hovering in the atmosphere over the northern Indian Ocean is also another concern. Studies show that decreased sunshine and increased acid rain source from this cloud. The government expenditure for education was 18% of the budget in 1999. Both public and private schools have made remarkable progress in the last decade. Further, there are private institutions that are staffed by community-paid teachers without formal training who provide basic numeracy and literacy skills in addition to religious knowledge. The modern schools are run by both the government and private sector, providing primary and secondary education simultaneously. As the modern English-medium school system expands, the traditional system is gradually being upgraded. By early 1998, more than 30 islands were equipped to provide education for grades, 8, 9, and 10. Some 164 islands provided education up to grade 5, 6, or 7. In Malé is the only school for grades 11 and 12, with a school in the southern most island of Gan scheduled to offer the final 2 years starting in 2002. Maldives has successfully achieved their Millennium Development Goal (MDG) of halving the proportion of people living under the poverty line to a mere 1% as of 2011. Starvation is non-existent, HIV rates have fallen and malaria has been eradicated. Despite these accomplishments and progressive economic growth, developmental issues remain. In particular, the country needs to address income and gender disparities. Development in Maldives has occurred predominantly in the capital Malé; islands outside the capital continue to encounter high poverty vulnerability, lower per-capita income, lower employment and limited access to social services. A country-wide household income survey in 1997-1998 showed that the average income in the capital Malé was 75% higher than in surrounding islands. Maldives’s Gini co-efficient stands at 0.41. Female household members: Lower female labour participation rate and therefore, households with a greater proportion of females will have lower household income. The difficulty of accessing social services and infrastructure in the outer atolls has meant that geography is a key reason for poverty and income disparity in Maldives. In islands far from the capital, there tends to be lack of production, inadequate use of fishery resources, low value chain development and insufficient credit for small-scale producers and entrepreneurs. The scarcity of land and water, the underdeveloped farming practices and absence of support services in atolls has meant low production and thus low incomes in these regions. Maldives also faces gender inequality. In a nationwide survey in 2007, it was established that one in every three Maldivian women between the ages of 15-39 has been a victim of domestic violence. The labour force participation rate of women decreased from 60% in 1978 to 37% in 2005. Maldives faces skill shortages and human resource development constraints causing fewer women to be employed. ^ "Maldives". International Monetary Fund. ^ "World Bank forecast for Maldives, June 2018 (p. 153)" (PDF). World Bank. Retrieved 11 September 2018. ^ "Download entire World Economic Outlook database". International Monetary Fund. Retrieved 2018-02-20. ^ "Ease of Doing Business in Maldives". Doingbusiness.org. Retrieved 2017-01-25. ^ "Export Partners of Maldives". OEC. ^ "Import Partners of Maldives". OEC. ^ "Report for Selected Countries and Subjects". Retrieved 2018-09-03. ^ "Gazetteer - Patents". www.billanderson.com.au. ^ "MMA". Archived from the original on 2015-04-02. Retrieved 4 March 2015. ^ "Which country has the simplest taxation system?". Slate Magazine. Retrieved 4 March 2015. ^ adbadmin (24 April 2007). "Domestic Maritime Transport Project". Retrieved 17 October 2016. ^ Bank, Asian Development (16 August 2012). "Maldives: Malé Container Port Boosts Economy". Retrieved 17 October 2016. ^ Bloody shark slaughter in the island paradise Der Spiegel (German), 09-15-2008. ^ "UNDP Maldives: Poverty Reduction". UNDP Maldives. Archived from the original on 2011-12-03. ^ a b c d “Vulnerability and Poverty Dynamics in the Maldives.” Institution for International and Development Economics. 2007-08-02. ^ a b "UNDP's response to the Global Economic crisis" (PDF). /www.undp.org. Archived from the original (PDF) on 2011-12-01. ^ "Child Poverty in Maldives". Ministry of Planning and National Development, Maldives. ^ a b "Rural Poverty in the Republic of Maldives". Rural Poverty Portal. International Fund for Agricultural Development. Retrieved 23 February 2012. ^ a b Naish, Ahmed (27 November 2011). "Eliminating Gender Inequality Essential for Development, Says President". Minivan News. Archived from the original on 29 November 2011. ^ a b "Maldives: Gender and Development Assessment" (PDF). Asian Development Bank. 2007. Archived from the original (PDF) on 2012-04-24. ^ "UNDP Maldives Country Office Gender Mainstreaming Strategy" (PDF). UNDP Maldives. Archived from the original (PDF) on 2012-06-02. ^ "Fast Facts" (PDF). United Nations Development Programme, UNDP Maldives. Archived from the original (PDF) on 2011-12-03. Tourism is the largest economic industry in the Maldives, as it plays an important role in earning foreign exchange revenues and generating employment in the tertiary sector of the country. The archipelago of the Maldives is the main source of attraction to many tourists visiting the island country.. Fishing is important to the national economy of Vanuatu. It is the main source of income for many in the islands and Vanuatu's biggest export. According to 2009 figures, approximately 77% of households in Vanuatu are involved in fishing activity. According to 2005 figures, Vanuatu caught 151,080 fish in that year, with frozen fish accounted for half of Vanuatu's commodity exports. 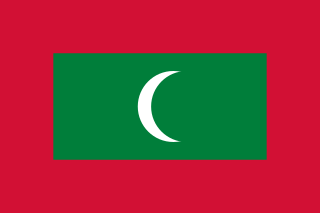 The Maldivian diaspora refers to the community of Maldivians, speakers of the Maldivian language, who have either emigrated from the Republic of Maldives or grew up outside of the Maldives speaking Dhivehi as a first language. The Republic of Maldives is a South Asian country geographically located in the Indian Ocean and Arabian Sea. Maldivians have historically emigrated from the Maldives for numerous reasons including low economic opportunity, political repression, environmental instability, and education. India and Sri Lanka currently host the most Maldivians living outside of the Maldives, but other diaspora communities can be found in Malaysia, Singapore, Pakistan, and Australia.